Steakhouses are everywhere you look in Vegas. And, for lovers of beef, this variety can make it hard to find the perfect place to sink your teeth into a juicy, tender piece of meat. But, never fear, today we have compiled our list of the 20 best steak spots in Sin City for you to try. It’s impossible to find a better Strip-adjacent steakhouse in the area than the Barrymore. Furthermore, this restaurant has a strong wine menu as well as delicious cocktails created by their innovative mixologists that are definitely worth a try. BLT Steak is known for its tender pieces of beef but, when you visit, make sure that you try their signature popovers made with gruyere cheese. Plus, their weekend Sterling Brunch gives patrons a chance to eat delicious slices of prime rib paired with unlimited Bloody Marys, mimosas, and other delicious beverages. Just steps from the casino, this restaurant mirrors the festive atmosphere, making it perfect for those who want to burn off some social energy. When here, be sure to sample their “Ultimate Steak for Six.” It is 7 1/2 pounds of beefy goodness. This restaurant provides customers with an intimate escape away from the chaos of the casino and serves prime cuts of beef alongside New Orleans inspired fare. Located next to the Palazzo’s atrium waterfall, Cut features a diverse menu and a decently sized bar where you can seat and sample from Wolfgang Puck’s infamous “Rough Cuts” menu. Echo & Rig is arguably the best steakhouse in the Summerlin area. They cook their quality cuts over red oak and each once is served with your choice of sauce and house-made garlic chips. This classic steakhouse has been around for so long that even the likes of Elvis and Frank Sinatra have sampled its fare. Their steaks are delicious but it is their deserts (like their Bananas Foster) that really take it over the top. 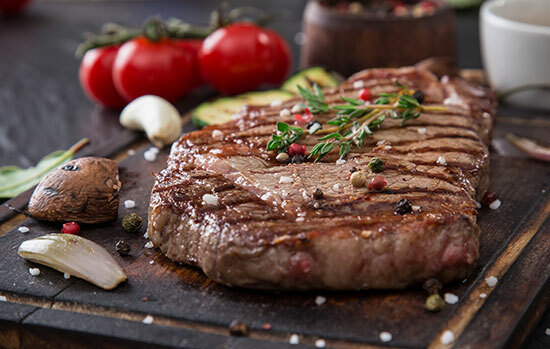 This local favorite is one of the best steakhouses in the Henderson area. It offers the best selections of wagyu southeast of the Strip and its elegant atmosphere will make you feel like royalty. The chefs at this steakhouse, located in the Mirage’s atrium, cook every single piece of meat over either a charcoal or wood fire. It also features a delicious chemical-free dessert menu that will set your taste buds alight. If you love steak, but often finds that the portions in most restaurants are too small, you will love Joe’s prime 16-ounce bone in fillet. Pair it with their large Mexican stone crabs for some of the best surf n’ turf you’ll ever have. This French-inspired steakhouse places a strong emphasis on superior customer service. But, it is their 28 day aged Iowa steaks (coupled with excellent patio seating) that will keep you coming back for more. An offshoot of one of the oldest restaurants in the US, the Old Homestead location in Nevada easily lives up to the reputation of its NYC counterpart. Their 24oz Gotham ribeye, paired with truffle butter, will make your mouth water. This isn’t surprising from a venue where even their burgers are made with dry-aged beef. This traditional steakhouse is designed to recreate the atmosphere of a 1930s speakeasy, albeit with a fine dining touch. It’s one of the most romantic places to have steak in the area, especially if you are lucky enough to get a table that overlooks the Bellagio fountains. When you step into Sonoma Cellar, you will be transported to another time, where you can get a delicious porterhouse for less than $40. Plus, it’s a requirement that every server take the Level 1 Sommelier exam, making them virtual experts on the perfect wine pairings for your meal. When driving through Pahrump, make sure you stop by Stockman’s. They are the best steakhouse in the area and their low prices will make you scream with glee. Stripsteak offers patrons a modern look that is a beautiful contrast to the traditional venues found at Mandalay Bay. Couple this with the duck fat fries and their wood burning grill, and it’s easy to see why this restaurant is a crowd pleaser. This restaurant offers the traditional steakhouse menu, but in a modern, brightly lit dining room. Plus, its outdoor patio (which happens to have a fantastic view of the Red Rock) is the perfect setting to enjoy your appetizers and drinks. This steakhouse offers something for virtually every palate, including venison, elk, wild boar, and wild game dishes. They also have a large cheese selection that pairs perfectly with the delicious wines on their menu. Although some would consider 35 Steaks + Martinis to be an upscale dining venue, it’s bourgeois atmosphere is softened by the live entertainment and its bright dining room. When dining here, be sure to try out their De Ville burger. It’s made with a wagyu patty, bacon, cheddar, onion confiture, and served with truffle fries. Their steaks are delicious all on their own, but when coupled with wild mushrooms, they are taken to a completely new level. Also of note is its delicious three-course deal which is one of the best steak house values in the area.